Tripp Lite Smart Online UPS systems offer high performance power protection ideal for critical server and network equipment in a variety of application environments. Online, double-conversion Uninterruptible Power Supply / UPS maintains perfectly regulated output power by continuously converting raw AC input to DC, then re-converting output back to AC. Sine wave AC output with +/-2% voltage regulation powers network equipment continuously, even during severe brownouts and overvoltages, all without depleting UPS battery reserves. 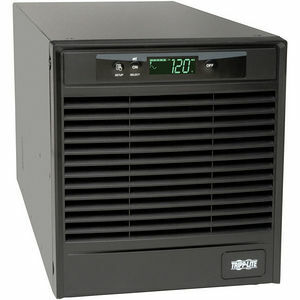 Maintains battery-derived AC output during power failures with zero transfer time. Extended runtime options available. Interactive LCD interface reports UPS operating mode, detailed UPS and site-power data, plus enables a variety of UPS setup and configuration options. Highly efficient operation in optional economy mode saves BTU heat output and energy costs. Network management interfaces support communications via USB, RS-232, contact-closure and optional SNMPWEBCARD network interface. Built-in DB9 port offers both enhanced RS-232 data and basic contact closure monitoring ability. HID-compliant USB interface enables integration with built-in power management and auto shutdown features of Windows and Mac OS X. Includes PowerAlert monitoring software and complete cabling. Emergency Power Off (EPO) interface. LCD display reports UPS operating mode, line power availability, battery mode operation, inverter operation, ECO mode status and output power availability. Audible alarm with push-button momentary alarm-cancel and silent-mode configuration options. Programmable self-test. Fault-tolerant auto-bypass mode. Field-replaceable, hot-swappable internal batteries and external battery packs.